Butera Royal Vintage Cigars were first premiered to the cigar world in 1993. These Butera’s are a hand-rolled premium cigar line individually crafted by highly skilled cigar rollers at the Tabacalera de Garcia factory in the Dominican Republic. 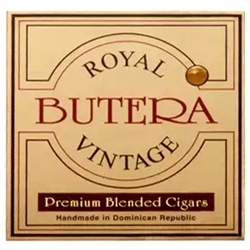 The Butera Royal Vintage are mild to medium-bodied in strength created with a combination of six distinctive whole leaf tobacco blends from 3 countries. Each of these premium cigars are highlighted with a stunning Connecticut Shade wrapper and an Indonesian binder. An excellent choice for any cigar connoisseur. Butera Royal Vintage is a classic premium line cigar offered at an everyday smoker's price, affordable and available to be delivered right to your front doorstep! Try the one of the varieties of sizes and flavors listed below at our online cigar store. Each of these styles are in stock today at a low discount price! Call us for more details!